More and more states have moved towards the abolition of the death penalty over the last fifty years. However, in many countries there has at the same time been a striking increase in the use of the sanction of life imprisonment, and an increasing number of prisoners serving indefinite sentences, often without the chance of parole. 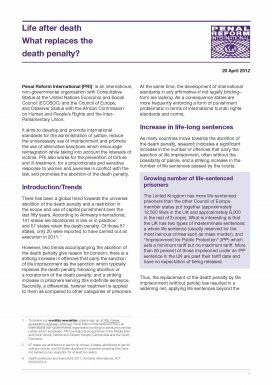 This short briefing paper sets out human rights concerns surrounding the increasing use of life imprisonment and gives recommendations for reform.